LAS VEGAS — The Consumer Electronics Show, the largest trade show for the technology industry, is warning attendees will see heightened security this year at the annual event. While the show's doors don't officially open until Tuesday, events are already beginning in Las Vegas, as a who's who in technology flocks to Sin City. One notable name who will be absent: FCC Chairman Ajit Pai, who last week cancelled his scheduled appearance after he reportedly received threats. 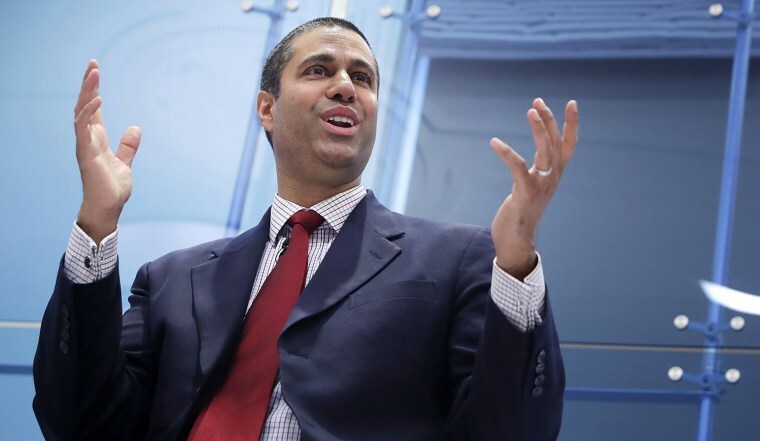 Pai has been weathering backlash after he spearheaded the successful rollback of Obama-era net neutrality rules last month, marking a major win for telecommunications companies and concerning open internet advocates. "The FCC did not tell us why he was not coming," Gary Shapiro, president and CEO of the Consumer Technology Association, told NBC News on Friday. While last minute cancellations happen, Shapiro said they are incredibly rare. "Having read the comments in the last 24 hours, I have to say, any decision he wants to make about his travel, I am comfortable with. He is one of the nicest people I have ever met in government," he said. With more than 2.7 million square feet of floor space this year — a record — Shapiro said plans had been set in motion nearly a year and a half ago to increase preventative measures at CES 2018. That includes turning to technology to help prevent crime. For the first time, CES will utilize the LiveSafe app, which lets users get safety alerts and report suspicious activity to security, via the app. That includes the ability to share text, photos, video and audio in a two-way chat with security. The app is already a popular choice at universities and was even integrated with California's Levi's Stadium app, providing an extra layer of security for people attending a San Francisco 49ers game. "It's so amazingly versatile and cool," said Shapiro. In addition to vehicle deterrence measures, the usual bag checks and "a more highly visible law enforcement presence throughout the show," CES is now requiring all attendees to have a photo on their badges. Now in its 51st year, it's expected personal robots, augmented reality and artificial intelligence — including an increasingly integrated Google assistant — will be the key themes this year.